A “Clearing Out The Freezer” Dinner. Dear r-reader, is it r-really you? It’s been millennia since we last…what? You sure? It has felt like an eternity getting through these recipes. I wanted to show how easy it is to use these seeds and in trying to prove it I’ve driven myself sightly mad, but it’s finally finished. I hope that all of you out there struggling to find new ideas for weekly meals will look at these and at least consider adding one, or all, of these seeds to your diets. They’re really worthwhile. I complain because these recipes are really basic and I needed to space them out and try them properly. I made it and still have some in date buckwheat groats. The first two recipes had a texture very similar to just amaranth, but today’s triple combo has a texture split down the middle. A soft, thick porridge combines with individual seeds firmness. It’s unusual, strangely like a crumbly porridge. An odd description, but apt. I did go for a nut butter option, but you can do whatever you like with the basic version. If all else you’ll find unique, interesting recipes here, whether people will try them is uncertain, but I like the fact that I can make this diet work. Okay, that’s all for today. No garden post to pester you with today as the promised weekend sunshine has vanished. I’m off to read and complain about the lack of spinach being planted. I don’t even eat it, but I want to grow it! Until later. 1. Put the Quinoa in a fine mesh sieve and rinse with cold water. 2. Add a little Olive Oil to the pot and heat. Add the Quinoa and cook until dried. Then add in the Amaranth, Buckwheat and Water. Bring to boil, reduce to a medium heat cover and cook for 15 minutes. 4. After the 15 minutes is up, turn off the heat. Let it stand for another 5 minutes. After 5 minutes, lift the lid and take a fork and fluff. Peanut Butter: Cook as normal. While cooking mix together 1 Tbsp Peanut Butter Butter, 1/2 Tbsp Olive Oil, 2 Cloves Garlic, Grated, a Pinch Sea Salt and Black Pepper until a smooth Paste is formed. Stir Paste into Amaranth, Buckwheat and Quinoa just before serving. That’s it right? All three seeds, Buckwheat, Quinoa and Amaranth have been combined in various ways. Well, I guess a triple cook is possible…Maybe. I’ll see. So, today the side is different as instead of the soft textured amaranth we’ve got two seeds that remain mostly firm and tasteless. That’s just gravy, you see what I did there? Yeah, yeah, anyway this is a perfect plain side to go with any intensely flavoured meal. Adding the stock and toasting the buckwheat helps take away the extreme blandness that these seeds taste of when cooked as is. I don’t really have much to add here, dear reader, there’s not much here just the measurements and techniques needed to cook this perfectly. Well, if you try it let me know. Take care. 1. Put the Quinoa in a fine mesh sieve and rinse with cold water. Set aside. Add Stock Cube to boiling water and set aside. 2. Add the Buckwheat Groats to the pot with a drizzle of Olive Oil and then toast on a medium heat until fragrant, lightly golden and just starting to pop. Add the Quinoa and cook until dry. 3. Pour Stock into the pot and bring to boil, reduce to a medium heat, cover and cook for 15 minutes. 4. After the 15 minutes is up remove from the heat. Let it stand for another 5 minutes. After 5 minutes, lift the lid and take a fork and fluff the Quinoa and Buckwheat. I’m trying baby corn for a while. It seems okay, like most vegetables it just tastes like nothing to me. Not bad nothing, so that’s okay. Bah! Dear reader, you’re loyal enough to already have seen this preamble about the usefulness of basic, healthy recipes dealing with lesser known ingredients, numerous times no doubt, so I won’t repeat it and that’ll save you and me a headache. You know what I have been thinking of? The fact that health is a pretty abstract thing when we’re viewing ourselves in regards wellness and well-being. What is healthy for you, for me? How does it feel? I think too often our feelings are overridden. Bear with me, I can think back, back to the fat-days, but I can’t remember what the strain on my bones felt like, the pains and aches, the general feeling of bad health. I can recall it in vague ways, in general terms, but not with the clarity of my feelings now. So how can a check-list of benefits really tell me anything of how a food will affect me, even another persons experience with an ingredient isn’t going to mirror my own exactly. When we see a post on something like amaranth or buckwheat that’s a run down of it’s nutritional values and benefits that does have it’s uses, but isn’t it’s effect on an individual more useful? You’re talking with someone who’s eaten alternative seeds or pseudo-grains for as long as he’s been on a restricted diet. Isn’t the fact that I eat these regularly more informative than regurgitating the same tired information on them in an informal way? If it isn’t then that’s fine too. I just hope there’s worth in these words and these recipes. What else could I eat? That’s a question I ask myself often. Take away these seeds and what else is there for me? I could find alternatives, but I like these, they keep me in good health, keep me full and satisfied. I remember when I first pledged to be better or to, well, truthfully: Die. Don’t despair, dearest reader, I’m still here, Jack is tough and inventive. But as I was saying, when I first started I said to myself that I would eat plain rice and chicken to be better, every single day if needs be. Thankfully I was able to create a diet that has plenty of options, but that was my determination Sounds like a bad anime, right? “I’m going t get stronger! Even if I have to eat bland Chicken and Rice every day!”) and I would have stuck to it. It’s also why I share these simple recipes, combinations of seeds all properly cooked, no guessing, the experience I’ve accumulated bringing you worthwhile, healthy and useful dishes. So, today side is simplicity itself. It’s a more textured amaranth, thanks to he larger seeds of the buckwheat, deliciously combined with nut butter, but that’s optional. Simple fare, but also enduring fare. I could, probably will too, eat this for life. There’s no taste here but what you add, well, there’s a bit of earthy taste from the amaranth, flooded with nut butter it vanishes beneath the creamy richness, thankfully. So, I’ve tried Amaranth with quinoa and now buckwheat. So next is Quinoa and Buckwheat? If it doesn’t expire first. One thing I should mention at if this came out badly then that’s me stuck for a dinner, I have no alternative, no other dish to whip up to replace it while everything else cools, it’s the reason I don’t try these things too often. The fact that they succeed is half luck and half knowledge. Okay, see you in a few for a garden post. A more chipper one, I swear! Later. Oh! Forgot t mention something. I’m not even going to try to cleverly work this in. The reason you toast the buckwheat is for flavour and the reason you let it cool it is to avoid heating the amaranth too much. I’m not sure if it’d affect that much, but it’s better to be safe than sorry. 1. Add the Buckwheat Groats to the pot with a drizzle of Olive Oil and then toast on a medium heat until fragrant, lightly golden and just starting to pop. Remove from heat and let cool for a few minutes then add the Amaranth and Water. Bring to boil, cover and cook for 15 minutes. 2. After the 15 minutes is up, turn off the heat. Let it stand for another 5 minutes. After 5 minutes, lift the lid and take a fork and stir the Amaranth and Buckwheat and then serve. Cashew Buckwheat: Cook as normal. While cooking mix together: 1 Tbsp Cashew Butter, 1/2 Tbsp Olive Oil and a Pinch of Sea Salt and Black Pepper until a smooth Paste is formed. Stir Paste into to Amaranth and Buckwheat just before serving. I feel like sighing. You see, dear reader, there’s no way to make a flour recipe interesting. You’ve seen the numerous uses I’ve put this flour through, this part, funny how I’m at the start after so long, is really rather dull and basic. Not only that, I have two flour recipes. Don’t sigh, dear reader, I’ll keep it brief. I could’ve called this kasha flour, but I’d rather avoid the confusion. It looks more or less the same as what I get in the shops. Okay, let’s see. Taste-wise I couldn’t see much difference, which either means the flour I’m using is already toasted or there isn’t much difference in taste between tasted and un-toasted and I’m not making raw flour to test. I did find that this ground really easily and it wasn’t difficult to get it fairly fine. It’s still a bit rougher, but it’s be fine in breads and scones. For pastry and flimsier doughs I’d prefer a finer grind. Look, dear reader, if you have the groats and haven’t tried this wondrous flour, but would like to without buying a large bag then try this, it can’t hurt. I have expiring buckwheat and I need to use it up, hence this recipe. It’s helpful to have. Go look at he buckwheat flour tag and see what you can do with it. I’m bailing out here, I have another post to type and it’s equally boring. I could be in the garden! Be good. 1. Add the Buckwheat Groats to a large pot, just a thin layer covering the bottom, and then toast on a medium heat until fragrant, lightly golden and just starting to pop. Remove from heat and pour onto a plate to cool completely. 2. Add about 1/4 Cup of Buckwheat to coffee-grinder and grind a few times, letting the grinder rest in between so as not to overheat the motor, until it resembles a fine powder. Repeat until all Buckwheat is used up. Either use right away or store in the fridge. “Doesn’t heated dairy make you queasy?” The things I do for recipes. I did warn you there would be a deluge of recipes with buckwheat, didn’t I, dear reader? This is going to be a short post as there’s very little to say about porridge. The interesting thing is that you cook the buckwheat the same way you would any other time, then you add the Milk. Which doesn’t even need to be brought to a boil as the pot and buckwheat are hot enough to warm it up. I use cow’s milk, but any non-dairy option would be fine here. It takes longer as it’s a double serving compared o the standard buckwheat recipe, but still it’s porridge, you just start it and leave it. As for taste, well, it’s as sweet, savoury or plain as whatever you add to it. The texture is actually pretty much the same as oat based porridge, a little lumpier perhaps, but still soft enough. This is mostly here because I couldn’t go through two bags of buckwheat and neglect the porridge recipe. I have one more new recipe readied for tomorrow, not buckwheat, and that should end the run. Then it’s back to thinking of new recipes. As for the garden, it’s mostly been wet and miserable, but warm enough to allay any worries. My onions are just starting to poke their little green shoots out of the soil, the potatoes are getting there too, but I have covered them again so they’ll take longer to reappear. If anything major happens, freakish warm weather, a sale on bulbs or compost, then you can be sure a Jack post will follow. Until tomorrow, take care. Optional: Add Sweetener and Fruit to Taste. 1. Add the Buckwheat Groats to the pot in a thin layer and then toast on a medium heat until fragrant, lightly golden. Add the Water and bring to boil, cover and cook for 15-20 minutes or until all the water has been absorbed. 2. Remove the lid and fluff with a fork, add in Milk and serve. What colour is this? Brown. Golden brown. Everything is golden brown! But it’s a seed you say. A groat is a hulled grain you say. Hey, my head hurts from reading the pack of buckwheat groats that are certified 100% whole grain and on the back of the package it states that it’s a seed. Are we ashamed of seeds? Have they had cause to be shunned so? Me and buckwheat are bosom buddies and you had better prepare for an onslaught of groaty recipes. This one is tweaked a little from here. I actually have had a suggestion to toast the buckwheat before cooking and I will be trying that too. This just popped up last night and I decided to test it out and see if the toasted seeds would retain their crunch after a night. They do. Really well. I poured them over pasta and the made a really groat, heh, substitution for croutons. I have stated, and won’t continue to state, have no fear, that these recipes will probably be common place, but they’re new to me, so, yeah. Er, I mean I’ve done, what feels like at least, everything with the flour, breads, pasta, wraps, crackers etc so I think I can be forgiven for taking the easy way for a while. As for the recipe: It’s real simple, but the groats, I’m doing that to mess with you, dear reader, really crisp up well and they didn’t burn at all, I’ve had that trouble with other seeds before this. Whether you want them as a snack or as an addition to a meal you could do a lot worse than good old buckwheat. I have one more recipe to try with it this week, then I have another marinade recipe that has been converted to a no-marinade, it’s ready already but I need a photo. So for a change there are a lot of recipes. I am busy in the garden still, but I doubt anyone but me would be excited to see photos of pots of potting compost. I’m still waiting on my dual-coloured rose. I have my seeds, but no germinating weather yet. I’m filling pots gradually and storing them in recycled trays in the greenhouse. The weather has been extremely changeable these days and it’s making Jack weary, but have no worries, dear reader, I have recipes to test and little gardening tasks to occupy me and flowering treasures to behold. I’d pick up again soon and the Jack posts will be plentiful. So, for now, eat your groats, gobble your seeds and know that Jack is always here, except when he’s not. Until we meet again. 1. Add the Olive Oil and Buckwheat to a pot or non-stick frying pan and cook on a medium heat until the Buckwheat is fragrant and has taken on a dark golden colouration. Pour onto a plate to cool. Store in an airtight container and use as needed. Okay two new twists already. First I want to thank Dolly from Kool Kosher Kitchen for the toasting before cooking tip. It makes a world of difference to the flavour of the cooked buckwheat, imparting a slightly nutty flavour hat pairs well with the addition of nut butter. Thank you Dolly, or rather, Dolly’s Grandmother. The second I have to thank, why, me! I took my Cashew Butter Amaranth and gave it a try with buckwheat and though it didn’t work quite the same magic it did give the buckwheat just the right taste and texture to boost it as a side. I made it with the toasted buckwheat, but I imagine either could work. So, two new options already and buckwheat continues to amaze and astound the culinary world. Or mine at least. The nut butter, paste for want of a better term, seems to work on soft seed/grains, ones with a mushier consistency, as I found it didn’t work with quinoa. Oh, yes, dear reader, I’m still working hard for your benefit, okay, mine. My head is not swollen from my fame. What fame? Shush. You read that right! Buckwheat, just buckwheat, I finally found gluten free groats in the shop, with a short expiration date because they aren’t going to do me any favours. Now, you may say, can you really do anything I haven’t seen with buckwheat before? Well, firstly let me say this: I will start at the bottom and learn everything I can, even if the information is already out then it means nothing to me until I master it myself and until I do I won’t share it with you. Secondly, let me say this: Do you know who I am?! I’m Jack of all (Pseudo) Grains! You know quinoa? Yeah, I’ve done so many things with quinoa. I even have crusty quinoa bread! Pah! Amaranth? Old pig-weed and I are as close as the Aztecs and sacrifi…er, amaranth. No problem. You remember kaniwa? That’s a trick question, no one does, but I used the quinoa-like seed and it was pretty meh. We don’t talk about kaniwa. So you ask if I can use buckwheat well? Can I do amazing things with the groats? You know what I say? Maybe. Heh. Come on, dear reader, you know me. I’m willing to try and the flour has been a rip-roaring success for me. I’m used to these seeds as sides and I don’t see buckwheat stumping me, but as I say I’ll start slow, probably repeat a lot of recipes you’ve seen before, but I’ll enjoy it and you’ll reap the benefit of my tests. Win-win eh? They look pretty much the same raw and cooked. 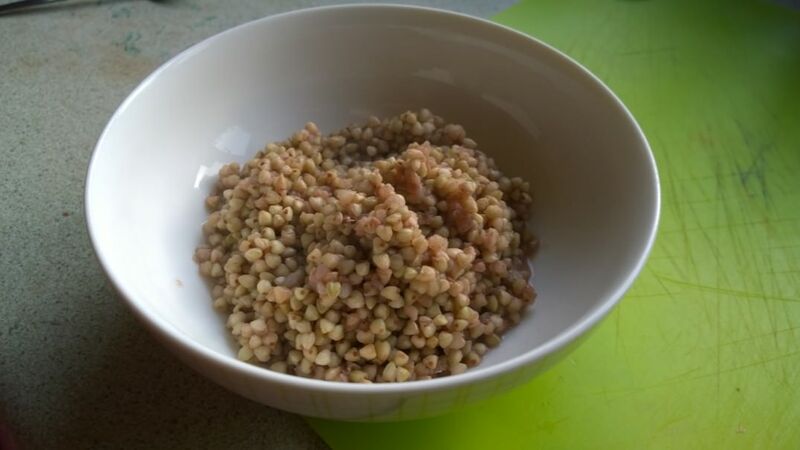 So, buckwheat, the groats are surprisingly fast to cook. I’d have imagined them to be tough and take a long time, but no. They are like quinoa in that here isn’t much taste and a little goes a long way. I used a half cup’s worth, but I’ll list the equivalent of a quarter which seems just right. The package recipe suggested a cup, but that’d be way too much for one. What I like is the size, they’re the largest gluten-free seed you can prepare like this (Right?). They are really tender when cooked too, which is nice. They still have a pleasant bite though. This is a savoury side preparation, I will try porridge too, but for now this is the way I want this. Not much to say here, they’ll differ depending on what you serve them with. Use them as you would quinoa, potatoes, any side really. This is just the beginning so keep an eye out. I’ve run through what feels like all the possibilities of buckwheat as a flour, it never really stops though so have no fear, and now I’ll see what uses I’ll find for the seeds. See you again soon. Optional: Add Butter and Salt to taste after cooking. 1. Put the Buckwheat and Water into the pot and bring to boil, cover and cook for 10 minutes or until all the water has been absorbed. Alternately: Add the Buckwheat Groats to the pot with a drizzle of Olive Oil and then toast on a medium heat until fragrant, lightly golden ad just starting to pop. Then just cook as normal. 2. Remove the lid and fluff with a fork and then serve. Cashew Buckwheat: Cook Buckwheat as normal. While Buckwheat is cooking mix together: 1/2 Tbsp Olive Oil, 1 Tbsp Cashew Butter, a Pinch Sea Salt and Black Pepper until a smooth Paste is formed. Stir Paste into to Buckwheat just before serving.